Boy Scout Greyson Acquaviva has the ambitious goal of making improvements to Civil War Defenses of Washington's Fort Stanton, Mile Marker 1.2, on 28th Street SE. Greyson's plan involves removing invasive plants and installing water bars (the wood in the pic below). Greyson can't do this himself and needs our help. 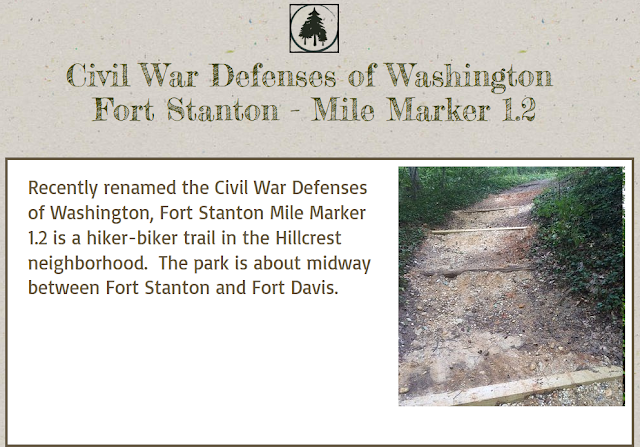 Greyson Acquaviva's Eagle Scout Project at Civil War Defenses of Washington (where you can sign up to volunteer) and the project website both describe the needs with the latter providing planning and other info. OCY wanted to help Greyson recruit volunteers and so we asked him to answer some questions. We hope you will find the project, and Greyson, as interesting as we do! Q: Tell me a little about yourself. Why did you become a Boy Scout? Why have you stayed in? My name is Greyson Acquaviva and I'm 15 years old. I am an active member and Life Scout, the highest rank before Eagle, in Capitol Hill Scouts Troop 500. I go to the Howard Gardner School in Alexandria Virginia. I live with two parents and three dogs. I became a boy scout because I loved going on hikes and being outdoors. I had a cabin that really fused my spark in cub scouts and even boy scouts. I actually was in cub scouts and that was really fun. I had lots of friends within my Cub Scouts pack. Two of them were really close to me. One of them, Jack, went to my school so I knew him a lot better than most scouts. Then there was a younger Cub Scout, Ryan, with whom I had a very good relationship with because his mom was one of the leaders for the Cub Scout pack. 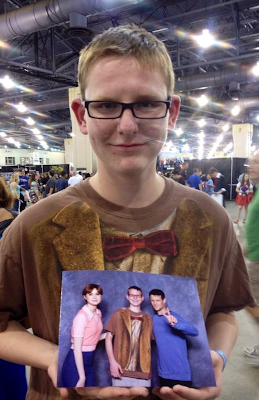 I helped him find his love of Boy Scouts and now he is hopefully going to be in our troop. I have stayed in Boy Scouts because it gives opportunities to learn something new and you get to do stuff you normally don’t do. I also stayed in scouts because I have always wanted to be an eagle scout and I just have one more step to making this dream become a reality. Boy Scouts is like another home to me because I hang out with awesome people, we cook really good food, go on fantastic trips together, and have awesome opportunities to do some good in the world. Q: What got you interested in the Civil War and/or Civil War defenses and Fort Stanton in particular? I have always been a huge history lover, especially as I have gotten older. It started in 6th grade with a great history teacher. We learned a lot about ancient history and I always loved the projects we did. I asked her if we were going to learn about American history and she said that in 8th grade, we would be learning that. What got me interested in historical wars was this cool TV show called Decisive Battles of the Ancient World which my teacher let us watch. It talked about battle formations, tactics, the history behind it, etc. In 8th grade, I had a new history teacher who was pretty cool too. We learned about American history and my favorite part was when we talked about the Civil War. I knew that I lived near a historical park and fort (Fort Stanton), which was involved with the Civil War. I never knew why until she talked about this specific fort. It’s is hidden history gem and is right near me. Q: What do you think people should know about Fort Stanton and the role it played in the Civil War? What’s really cool about Fort Stanton was that it was on the edge of the border marking Union land with Confederate land all around in front of them. Fort Stanton’s sole purpose was to protect the navy yard and to guard the bridge between Anacostia and Washington. If the Confederates were able to get by that fort, the Union probably would have lost. What’s really amazing is that it never did battle with any Confederates. Q: What do you hope people get out of the volunteer experience? There are a couple of things that I hope people get out of the volunteer experience. The first thing is that I hope that people will go to this park a lot more and make sure it is well maintained. This park has eroded a lot over the past couple of years, trashed and littered upon, and is overgrown with invasive species, mainly English Ivy. I also hope that people will get an appreciation of the hard work the National Park Service does to keep our historical parks and trails in good condition. I am grateful to Ranger Kevin Barry for working with me throughout the past 12 months to create this project to help one of the National Park Service’s parks. Finally, I hope young people will get interested Scouting because it is great opportunity to try new things and it is a lot of fun. I would greatly appreciate volunteers. It will be a lot of fun and you would be doing a great service to the park. Volunteers who work a full 3-hour shift will get either lunch, a big snack, or dinner. If you want to volunteer, contact me via email or you can sign up at www.SignUpGenius.com/go/20F0D4DA9A62EA2F94-greyson. Remember, you can help Greyson improve Fort Stanton Park for all of us. Sign up to volunteer October 18 or 19.